I mentioned in the last post that I planned on writing a short piece on a manuscript related to the al-Baʿṭūr library (formerly on the island of Jerba) currently held in the Universita degli studi di Napoli l’Orientale. This comes from a footnote of a related article I am currently writing on the Ibadi manuscripts in Naples and also about another article on the al-Baʿṭūr library that I wrote for a recent conference in Jerba. Hopefully that will be published and I can share a link to it here soon) Naples MS ARA 50 is a copy of the Kitāb al-waḍʿ by Yaḥyā b. al-Khayr al-Janāwanī (d.5th/11th c.)  The work belongs to a core curriculum of works of Ibadi jurisprudence 11th to 13th centuries and there are many, many copies of the work scattered throughout libraries in northern Africa and beyond. It is a mukhtaṣar, useful for both study and teaching and as an introduction or refresher on Ibadi fiqh. 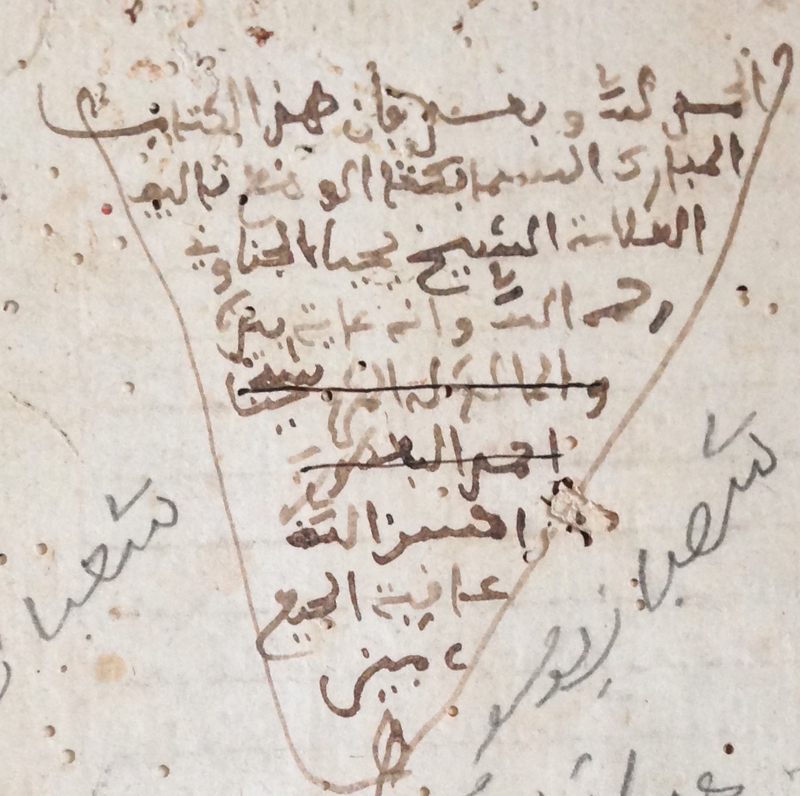 Many extant manuscript copies of the work (including Naples MS ARA 50) also include the marginal commentary of Jerbian scholar and commentator Muḥammad b. ʿUmar al-Sadwīkshī “al-Muḥashshī” (d.1088/1677) . With only a short, and apparently incomplete hand-list of the books that used to be in the al-Baʿṭūr library, it is small para-texts like these that give hints to the history the al-Baʿṭūr family and the grand collection that used to belong to them. Alone, this little note does not mean much. But combined with many more, it has the ability to tell us a lot more about the history of this family and library. This serves as a good reminder not only of the limited lifespan of manuscript libraries and books but also on the rich information that can be found in the margins of the “main” texts of Ibadi manuscripts. Just imagine what could be accomplished if all of these kinds of para-textual data were compiled and analyzed! This entry was posted in Manuscripts, Private Libraries, Public Libaries & Archives. Bookmark the permalink.